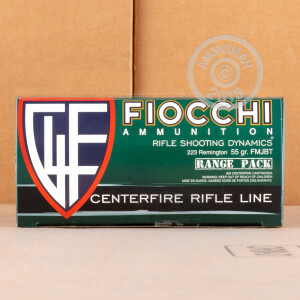 Fiocchi’s Shooting Dynamics line of ammunition performs nearly identically to their premium Exacta ammo, but is more affordably priced so you can think about your aim rather than your paycheck. 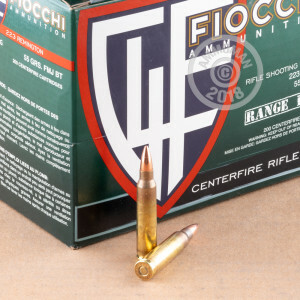 This 223 Rem cartridge features a 55 grain projectile, so it provides good training for most other loads in its caliber. Its bullet has a hard full metal jacket, so it feeds reliably, penetrates targets well, and will not cause lead fouling in your rifle’s barrel. The bullet further features a boat tail design, which streamlines its profile to give it lower sensitivity to crosswinds, higher velocity downrange, and greater energy during impact. This round’s brass casing and non-corrosive Boxer primer make it all but untouchable by corrosion, so you can confidently tuck it at the back of a drawer for several years if you choose to. These 1,000 rounds come in only five range packs as well, making them convenient to grab one the way out the door to a heavy day at the range.